The new year showed Port Maritime Councils across the United States standing in solidarity with federal workers hurt by the partial federal shutdown as well as striking teachers in Los Angeles. 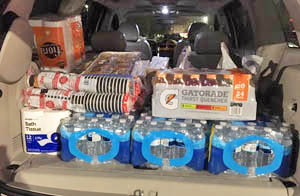 The Southern California PMC provides a vanload of goods for striking Los Angeles teachers. 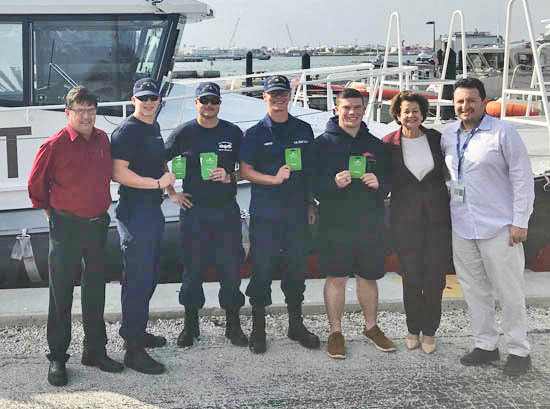 Coast Guard personnel show off some of the grocery store gift cards given by the South Florida PMC during the shutdown. Hawaii Ports Council members prepare groceries for furloughed federal workers. 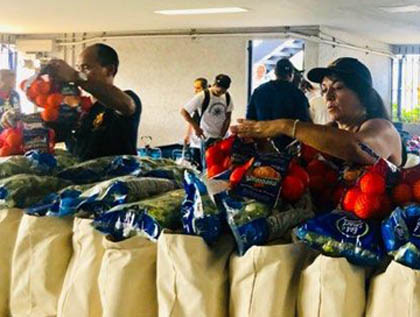 After taking part in a labor solidarity march through Honolulu’s Daniel Inouye Airport, members of the Hawaii Ports Maritime Council gathered food and other goods for a drive-through food bank at the Seafarers Union hall for furloughed federal workers. PMC Secretary-Treasurer Hazel Galbiso reported several hundred families appreciated the help their fellow trade unionists offered. The shutdown affected family members of people serving in the Coast Guard, who missed two paydays. Both the Greater South Florida and the Michigan Port Councils donated grocery-store gift cards to help those serving the country put food on their tables. 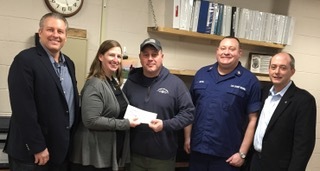 Michigan PMC President Jeannette Bradshaw delivers a donation to help Coast Guard families caught in the shutdown. When the United Teachers of Los Angeles launched January 10 what became a six-day strike, the Southern California Port Council immediately responded. According to PMC President Larry Barragan, the council adopted Fries Elementary School in Wilmington, California. Barragan personally delivered a food, water and other goods on behalf of the Council. Members joined teachers and parents on the picket line to show solidarity.